Capital Sons: Heart on our sleeves rock and roll..
Seamlessly blending their musical influences and pop-rock nature into a high energy, unique and lyrically poignant mix, Capital Sons has a sound that is fresh, yet recognizable. Led by Karl Obermeyer, Capital Sons brings undeniable melodies and heartfelt lyrics to audiences, all anchored by a rock steady rhythm section. 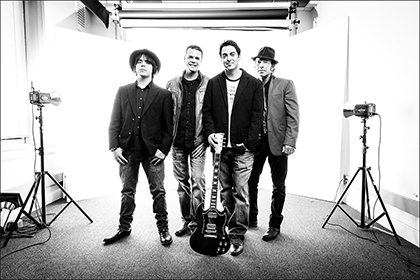 The band members - Obermeyer on vocals and guitar, Mark Marrinan on drums, Cy Dodson on guitar and keyboards, and John Tetrault on bass and vocals - have earned a reputation as an original and expressive band making their mark on the Twin Cities and beyond. With the release of their critically acclaimed self-titled EP (2005), Capital Sons has had generous airplay on FM 89.3 The Current. Word of mouth has spread and their live performances routinely draw loyal fans into venues throughout the Twin Cities. Their debut album offered creative pop-rock harmonies with a classic feel, and their sophomore release Dirty Neon (2009), featured more heartfelt lyrics and intriguing song arrangements. "Our music is heart-on-your-sleeve rock and roll," says Obermeyer, "no fluff, no gimmicks, we get up on stage and play our songs. We play the music that comes naturally to us...it's that simple." 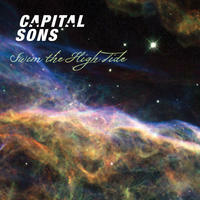 Capital Sons' newest release, Swim the High Tide, features the band's most mature music thus far. The album finds the band incorporating complex harmonies, Hammond organ, piano, ukulele and even sitar to round out this solid collection of songs. "This is definitely the strongest and most interesting music we've created yet," says lead singer, Karl Obermeyer, "We're firing on all cylinders musically." You can find out more about Capital Sons on their website. Capital Sons lives in Minnesota, USA. Tagged as: Alt Rock, Rock, Classic rock.